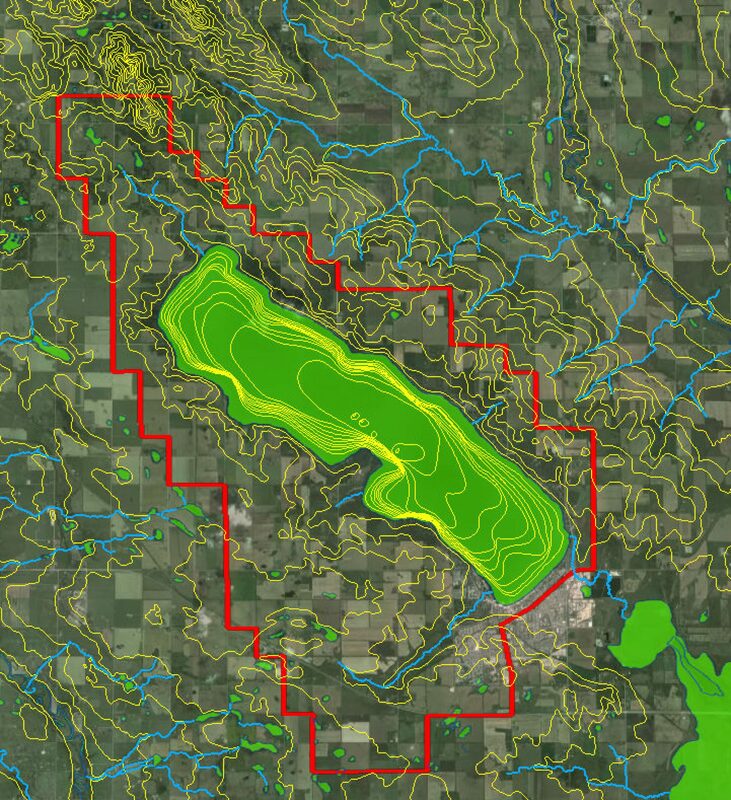 The focus of our Society’s stewardship initiatives is on the state of the watershed within the red-line hydrological boundary shown in this consolidated topographical and bathymetric GIS map. In 2018 the Society collected data on Sylvan Lake water quality and the water balance and groundwater supply in the watershed. We advocated for applying stewardship fundamentals to improvement and management of both land and water use. As an overview, risk is off for Sylvan Lake water quality degradation. The SLWSS Board retains a core of dedicated members who conduct essential business of the Society when required. At issue is the viability of and need for the SLWSS within the watershed community. We sampled Sylvan Lake three times in 2018, once each in June, July and August in a joint research project with ALMS and funded by the RDRWA and the Society. Watershed municipalities declined our invitation to participate and co-fund the fieldwork. Progress reports are posted on the Society website. A video and two photo albums for July 10 and August 14 show how instrumental measurements were made at the deep water station, ten water column samples were collected over the whole lake area and combined as a composite for laboratory chemical analysis, and plankton were netted and filtered for later identification and a separate zebra mussel invasive species check. All water composition data are entered into the master Alberta Detailed Surface Water database so we can detect changes over time. More than three decades of chemical analyses are compiled in this master graphic that displays all the data. The ALMS LakeWatch Summary Report for 2018 compares Sylvan Lake, now classified as oligotrophic, to other Alberta lakes. Sylvan Lake received little runoff from spring snow melt and had a major shortfall in precipitation during 2018. Lake evaporation started in early June, about a month earlier than usual, and caused a net lake level drop of 0.26 metres and loss of almost 11 million cubic metres of water. Lack of ground-saturating rain prevented aquifer recharge and the groundwater inventory depleted. Population expansion increased demand for domestic and industrial water Consequently the export of wastewater plus stormwater outside the watershed boundary increased. A series of studies by the Alberta Geological Survey (AGS) suggested that the regional groundwater has no safe extraction rate. The Society advised municipalities of those AGS findings. Progressive eutrophication of Sylvan Lake that can be attributed to land development and land use changes was not evident in 2018. The Society applies Professor Schindler’s expert advice by combining “vigilance and science” to determine if urban expansion threatens lake water quality. Nutrient concentrations in the lake remained at low levels. Lack of rain prevented discharge of land contaminants into the lake. Some notable development properties have attracted little interest. The Society message to municipalities is unchanged: 1) protect riparian zones; 2) apply Low Impact Development standards; 3) conserve water in the watershed. A funding request sent to watershed municipalities by the SLWSS Quiet Enjoyment Subcommittee was met by silence. Evidence is that most lake-noise-affected populations do not complain to their municipal councils. A new Sylvan Lake Intermunicipal Development Plan (IDP) is required by 2020. The Society has mapped the proposed IDP area and concluded that the extra land outside the core watershed hydrological boundary cannot transfer and discharge water into Sylvan Lake. It is effectively quarantined and isolated as diffuse source land by regional topography. Related environmental, and water, and economic factors raise basic governance questions about the viability of any forced cooperation among municipal governments to comply with the Municipal Government Act. The Society proposes that stewardship principles embedded in our report Responsible Care of Your Watershed and our guidance on Stewardship Standards be adopted as the foundation of IDP 2020 environmental management commitments. Environmental lawyer Dr. Judy Stewart agrees. The SLWSS explained Tools and Methods for Lake Stewardship to the AEP Alberta Recreational Lakes Forum at Pigeon Lake on May 10. The SLWSS maintains essential contact with government departments and agencies when they provide us with reciprocal value. In our experience, the delivery of expert consulting services to our community stewardship group is not a priority for them.